Started as a fun idea at a party in 2015, When in Manchester Festival returns for its 5th edition presenting the UK&apos;s best up & coming artists. 18 artists, 3 venues, 1 day - When in Manchester Festival is back! 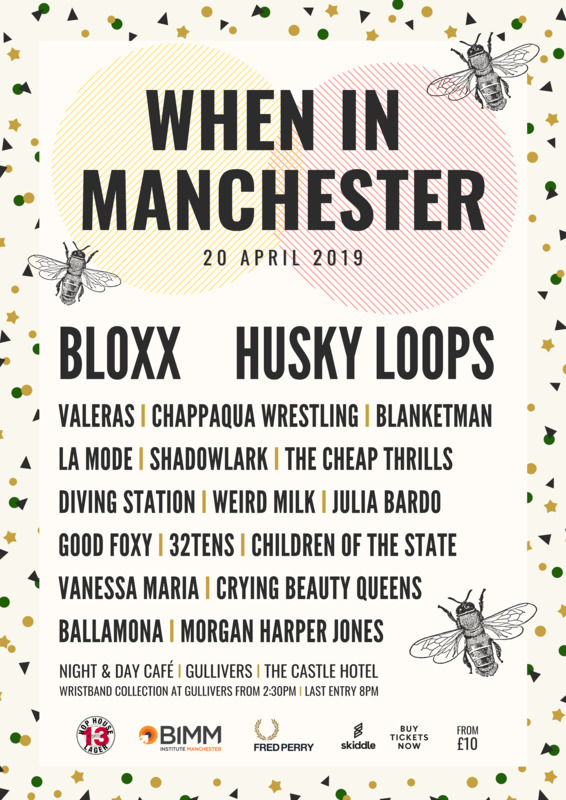 When in Manchester Festival returns to the Northern Quarter to showcase the UK’s most exciting up and coming artists of 2019 including BLOXX, Husky Loops, Chappaqua Wrestling and many more! When in Manchester Festival is a one-day metropolitan music festival, taking place across three independent venues in Manchester’s Northern Quarter on Saturday 20th April 2019. The festival will showcase 18 up and coming UK artists in association with 13 Hop House Lager, Fred Perry, BIMM Manchester and Skiddle. See the flyer below for the full line-up!